Palmistry unnerves people because they feel that a certain thing is fated to happen. But when we go to a doctor with high cholesterol or other symptoms, are we frightened, even though we know what could probably happen if we continue a certain way of life? If we can go to a doctor without being afraid, we can certainly go to a palmist...because that nothing is "fated" to happen. It's all in our own hands. 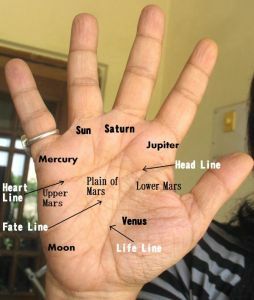 A good palmist or hand-reader also gives you a diagnosis and tells you of certain trends in your life as well as the probability of a certain event happening...if a certain lifestyle and behaviour is continued. The work has to be done by you. Your character is your destiny. Your destiny is not dependent on chance but on yourself. If we change, our lines change and with it our future. And just as no doctor can predict with certainty that a heart attack will happen, a palmist cannot foretell future events with any certainty. If palmistry cannot foretell the future with certainty, it is not a disqualification of palmistry. It is, in fact, its qualification. Because if our future was pre-determined, what is the point of palmistry or any other such study? It is precisely because we can change our future that we get our hands read. To know our weaknesses and strengths and to see where the obstacles lie. It is difficult to get hold of the handprints of famous people but their hands are often widely photographed, particularly at rallies. Although the lines are not clearly visible, the shape of the hand and fingers are, and they can reveal something about the personality. In this case, about the personality of Lal Krishna Advani. Advani has slightly thick fingers, with plump third phalanges, particularly the third phalange of Apollo or the ring finger. The palm is long, the mounts are developed, particularly that of Moon and Mars. The fingers are of medium length. The Jupiter (index) finger seems to be slightly bent and the thumb is supple, held close to the hand and a little high-set, although the thumb phalanges are fairly well balanced. The first phalanges are long and the heartline clearly dominates the headline and the Mercury (little finger) is long. All this tells us a story about who LK Advani really is.